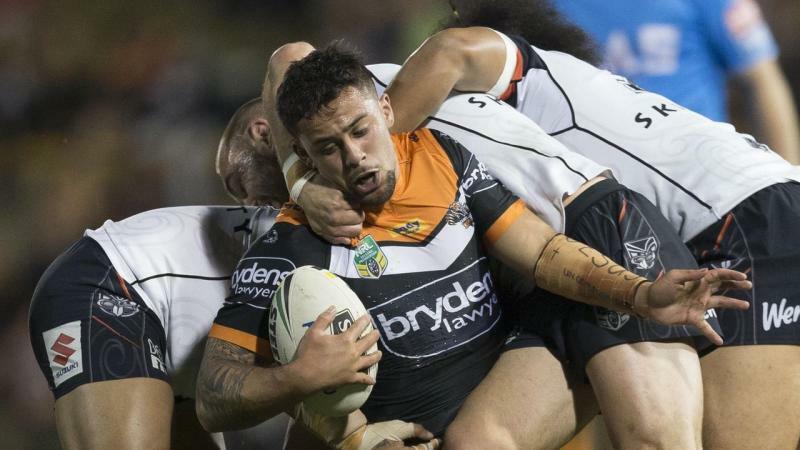 For those who don't know the back story, it would be easy to think that Wests Tigers NRL recruit Ryan Matterson and teammate Josh Aloiai don't get along. One of the last times the pair were on a rugby league field together before Saturday night at Leichhardt, they were face-to-face staring each other down mid-haka in an under-20s Test between Australia and New Zealand in 2014. But the reality is, that apparent aggression couldn't be any further from the truth after the pair formed a close bond as Parramatta under-20s teammates that same year. "A lot of people wouldn't have understood the story behind it, but it was kind of a celebration and respect. Everything coming together," Aloiai told AAP. "He knew that and I knew that. I always tease him and say when I was doing the haka he couldn't look me in the eye. He might have had some water running down his leg." Reunited now at the Wests Tigers, Aloiai described Matterson as his first best friend since he arrived in Australia five years ago. Back then, Matterson was his halfback and ball-player. Aloiai the playmaker's bodyguard in defence and hole-runner in attack. "It was funny that year, me and Matto both being believers and Christians, we had a goal at the start of the year (2014), both of us are going to represent our countries together," Aloiai said. "So that whole year we worked hard together and played for each other. That was our goal. "I think at the end of the year I was the first one to get the call, that I made the Junior Kiwis side. And I was waiting for Matto then he rang me and he goes, 'I made it'. "That was the goal we had all year. The thing we were playing for, we both got it." Matterson left for the Sydney Roosters in 2016 and Aloiai the Tigers, but the pair have remained close. Aloiai sat in the crowd for Matterson's Roosters debut that year and he was the first man to find out his best mate's move to the Tigers. Now a middle man himself, Aloiai and his mate Matterson were the Tigers' best running forwards in Saturday's win over Manly and they look forward to working in tandem for several years. "We work really well together. It's pretty special. We've both had a lot of setbacks, it's not been an easy journey," Aloiai said.